(November 2012)  For more than 30 years the Nights Before Christmas Candlelight Tour of Homes has been welcoming area residents and guests to take a look inside Madison, Ind., residences, churches and buildings. Visitors enjoy the festive decorations and can get a glimpse into Christmases past as many of the historic sites take care to decorate according to the traditions of the homes earliest residences.  Dates: Nov. 23-25; Nov. 30-Dec. 1 in Madison, Ind.  Organizing Sponsor: VisitMadison Inc.
 The Koleeta Tonkin House, 214 Baltimore St.
 St. Johns United Church of Christ, 501 E. Main St.
 Schussler House, 514 Jefferson St.
 The Shrewsbury-Windle House, 301 W. First St.
 The Kirk-Webster-Dorsey House, 613 W. Main St.
 The Lanier Mansion, 511 W. First St.
 Jefferson County Historical Society, Heritage Center, 615 W. First St.
 The Gayle and Brenda Liter House, 916 W. Main St.
 The Presidents Residence at Hanover College, 554 College Ave., Hanover College Campus.  The Crowe-Garritt House, 172 E. Crowe St.
 Eggleston School, 419 East St. This years tour takes place over the weekends of Nov. 23-24 and Nov. 24-Dec. 1. The tour features 11 private homes and historic buildings and three hospitality sites. Tour hours are 5 p.m. to 9 p.m. Fridays, and 3 p.m. to 9 p.m. Saturdays. The tour, organized annually by VisitMadison Inc., has been expanded this year to include two stops in nearby Hanover. Among them is a unique peek into history with the addition of the the 1824 Crowe-Garritt house, 172 E. Crowe St. It stands as an important piece of history to the Hanover community and college and is listed on the National Register of Historic Places. The structure is not only the second oldest house in Hanover, but it also served as home to the founder of Hanover College, John Finley Crowe, and as the first post office for the small town. Keach recalled a story often told about its famous original owner. College founder and pastor Crowe had a son who married out of favor. He says that Crowe disapproved of the match, and he wouldnt turn them out, but he didnt want to make things too comfortable for them. So Crowes son and his new bride were given quarters in the dirt floor basement. For the first 94 years of the homes existence, it remained in the Crowe family, first owned by John Finley Crowe and later his son-in-law, Dr. Joshua Bolles Garritt. During that time, the house served not only a beloved family residence but also a gathering place for alumni when they returned for visits and reunions. The house eventually passed out of the family, and in 1979 the historic property faced demolition. Former Hanover faculty member Robert Ireland stepped in to help save the property, and a group of Hanover residences formed the non-profit Friends of the John Finley Crowe House. They started and what they did was they sold shares for $50 a share. When we came up with extra money, we would buy a share or two, Keach recalls. When renovation plans called for a portion of the home to be torn down, the Keach family pledged the money to preserve it intact. 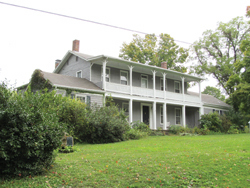 In light of the familys support of the renovation project, Keach and his late wife, Serena, were given the option to purchase the property and they wound up completing the renovations and moving in to the house in 1984. Its a labor of love. Theres a lot of blood, sweat and tears in this house, Keach says. College is on the National Registry. In addition to having a love of historic preservation, the Keach family also holds strong Hanover ties. Both Paul and Serena were graduates of the college, and Pauls father taught there for about 30 years. A second stop in Hanover will be the home of Hanover College President Dr. Sue DeWine and her husband, Mike. It is located at 554 College Ave. Constructed in 1952, the current Presidents Home was a gift to the President from William H. Donner, an alumnus who tragically died just one year after its completion. The tour also includes several stops in downtown Madison and three hospitality sites along the route. The Madison sites include the Lanier Mansion State Historic Site and the Jefferson County Historical Societys Heritage Center, featuring a model train display by the Hanover Model Train Club. She says that many families use the tour as a way to kick off their own holiday season and will bring in family and guests from out of town to enjoy the sights. Jones said she expects the event to draw between 2,500 and 3,000 guests. She said it takes about 200 volunteers to staff the private homes over the tour weekends, and she invites area residents who are interested in taking part to contact her to learn how to get involved. While the historic sites provide their own staff and volunteers to serve as guides, the individual homes require hosts to welcome visitors and share information about the houses. Tickets are $13.50 and may be picked up at the Lanier-Madison Visitors Center, 601 W. First St. When picking up their tickets, guests are also invited to enjoy the return of the Great Cookie Caper and pick up a box of homemade cookies with proceeds benefiting the Big Brothers, Big Sisters organization.